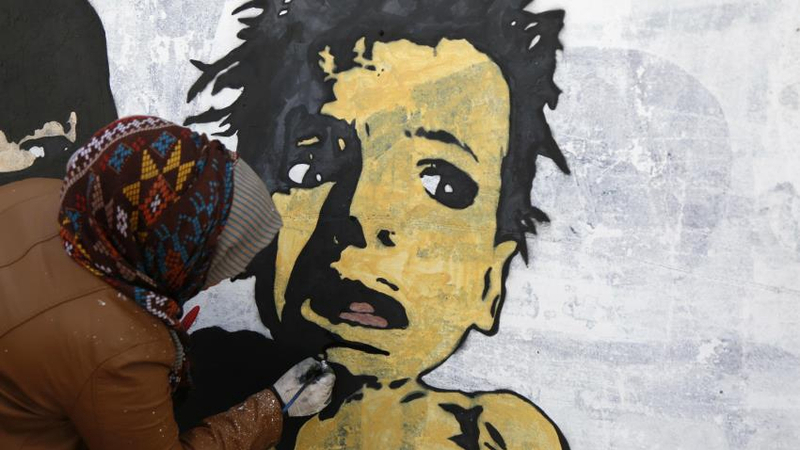 Young artists lined up across a wall in the Yemeni capital Sanaa on Thursday painting murals that reflect their fears as well as hopes in a country crippled by war. “We are here as a tribute to art and culture and to spread the message of peace in an attempt to revive what this war has taken from us,” Haifa Subay, her glasses spotted with white paint, tells AFP. The graffiti artist is taking part in an open-air exhibition, painting a mural of what seems to be an abstract face with words of hope and encouragement in bold, red letters. “The war has destroyed Yemen. It has destroyed all the capabilities of this beautiful country,” she says from the rebel-held capital. The conflict between the pro-government forces backed by a Saudi-led military coalition, and the Iran-aligned Huthi rebels has pushed the country to the brink of famine. Since 2015, when Saudi Arabia and its allies intervened in the war, around 10,000 people – mostly civilians – have been killed and more than 60,000 wounded, according to the World Health Organization. Rights groups say the real figure could be five times as high. 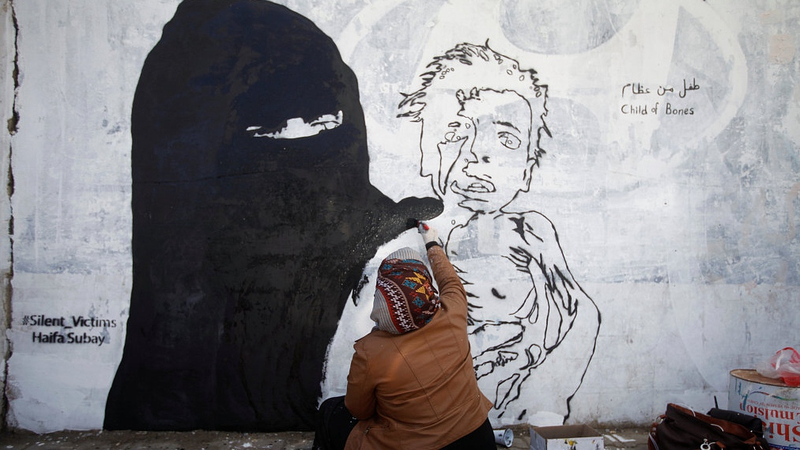 Like Subay, Thiyazen al-Alawai hopes to bring back life to the city through his art work. 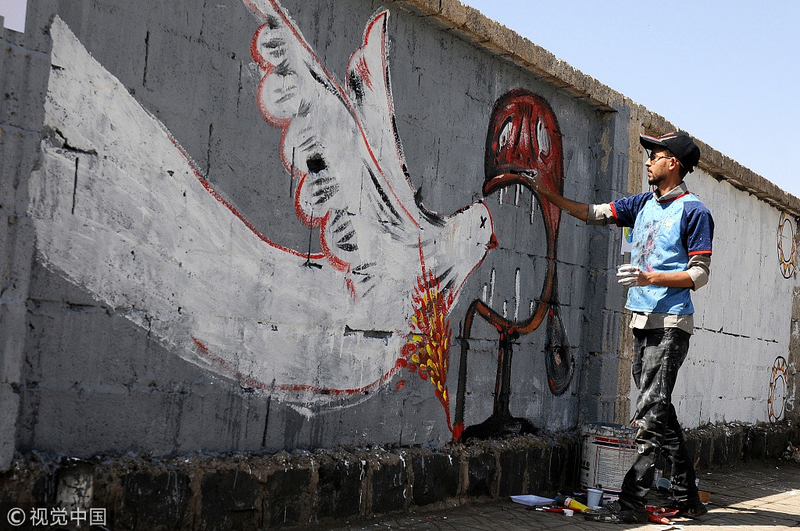 File of a Yemeni artist draws graffiti during an Open Day of graffiti campaign call for peace on March 15, 2018 in Sanaa, Yemen. A teenage boy donning a hoodie and a respirator mask spray paints a wall using his country’s flag colors: red, white and black. Another wall has the word Arabia Felix, or Happy Arabia – used by the Romans to describe the part of the region to which Yemen belonged and was home to the legendary Queen of Sheba. “We just hope that Yemen returns to the way it was,” said Subay. Posted in All PostsTagged 2019, annual event, Art, CGTN, China, graffiti, murad subay, Open Day of Art, street art, War, yemenBookmark the permalink.